Sometimes you make something and you just say, “Wow, that is tasty.” Maybe it isn’t the prettiest thing you’ve every made, or the most refined, or the most complex. But it might be one of the tastiest. This happened to me last night and I’m glad that we had friends on hand to share it with us. This is one tasty timbale. What is a timbale? The best description I can come up with is that it is a crustless quiche but made in a round ramekin and then unmolded. Two of the cookbooks that I have from the Greens restaurant in San Francisco (The Greens Cookbook and Fields of Greens) have recipes for timbales and I have been tempted for years to make them. I always thought of them as client worthy meals but was almost positive that this is the kind of thing that needs to be served very soon after coming out of the oven. I wasn’t sure how they would hold up after a several hour waiting period. The flavor here is incredible. 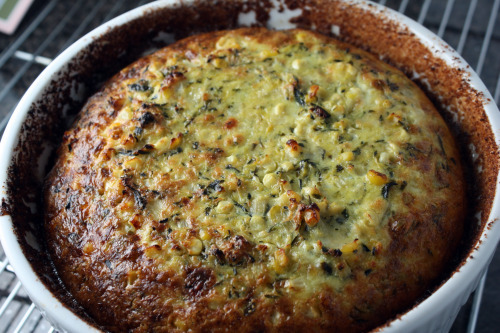 I mean, how can you go wrong with zucchini, corn, herbs, and sharp white cheddar? But what really made the dish was the sauce. I had my doubts about this blood red chile tomato sauce. I made it the day before and was a little concerned about it being bitter. Turning to Twitter, I learned from the ever knowledgeable Chef Gwen (who writes the lovely blog Pen and Fork), that I had probably over toasted the ancho chiles. Her advice was to add a pinch or two of sugar and just a splash of apple cider vinegar. That did the trick. The sauce has an incredible smokiness and piquancy – a perfect foil for the richness and sweetness of the timbale. All in all? Very tasty. I’m presenting the recipe more or less as written. As stated above, I made this in a 2 quart soufflé dish which I did not put in a water bath. If I were to make it with ramekins, I would do the water bath method. Grate the zucchini by hand suing the large holes on a grater, or process it in a food processor. Place in a colander and toss it with salt. Let it sit for half an hour, then squeeze out the water, either using your hands or putting the mass in a clean kitchen towel and twisting hard several times. Melt the butter, add the onion, followed a minute later with the corn, parsley, and cilantro. Stir together and cook over medium heat for a minute; then add the zucchini and wine, lower the heat, and cook covered for about 3 minutes. Remove the lid and cook off any remaining liquid. Taste and season with salt, if needed. Beat the eggs, whisk in the cream, then add the vegetables and cheese. Season with the cayenne and Tabasco sauce if using, and taste again for salt. Preheat the oven to 325°F. Generously butter 1-cup-capacity ramekins, or a large mold, and coat them with the bread crumbs. Mix any extra bread crumbs into the custard; then ladle it into the ramekins, making ure there is an even distribution of vegetables. Set the ramekins in a deep pan and add enough hot water to come halfway up the sides. Bake until the tops puff up and are browned, about 1 hour. Prepare the Ancho Chile Sauce while the custards are baking. Take the custards out of the oven and let them sit for a few minutes, then unmold them. Serve them top side up on a plate with the sauce spooned around or over them. To count down on time, I used two 15 ounce cans of Muir Glen’s fire roasted tomatoes instead of grilling or broiling as described below. If possible, grill the tomatoes over a charcoal or wood fire until they are soft but the skins have not blackened. Otherwise, broil them for 5 to 8 minutes, turning them frequently, until they are soft and the skins are blistered. Purée in a blender and set them aside. Preheat the oven to 350°F. Roast the garlic cloves until they are soft inside and slightly browned on the outside, about 20 minutes. Let them cool briefly; then peel. Put them in the blender with about 1/4 of the tomato purée and blend until smooth. Roast the ancho chiles in the oven until they puff up and are fragrant, about 3 to 5 minutes. Remove the stem, seeds, and veins, tear into pieces, then blend in a small blender jar or spice mill. (DT: I use a coffee grinder for grinding chiles and spices.) Roast the oregano in a dry skillet until it is aromatic, and remove it to a dish to stop the cooking. Heat the tomatoes; season them with the garlic purée, chiles, oregano, and salt and simmer for 15 to 20 minutes. I’ve never had or made timbale before but if it’s anything like this I know I’d love it! It looks so delicious, homey and comforting. I wonder if Chef Gwen’s tip for fixing your sauce would also work when I burn spices in pans! Sadly probably not but it’s a good tip to keep in mind. Oh this looks delicious. I’ve made spinach timbale before, I even have the molds. What a great dish! A great way to use up the summer zucchini! 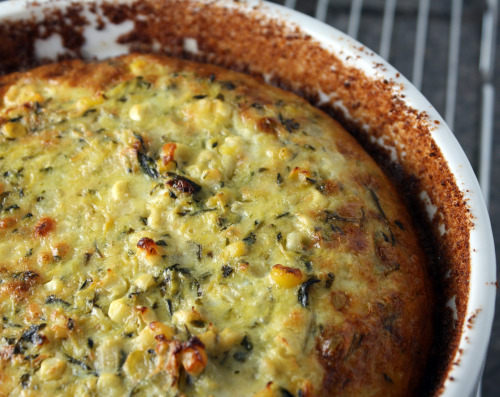 This sounds like a great way to enjoy the corn and zucchini! I once heard that “ugly is delicious” and I firmly believe it! The ugliest foods are often the tastiest, probably because they’re stripped of pretension and just pack yummy flavours. 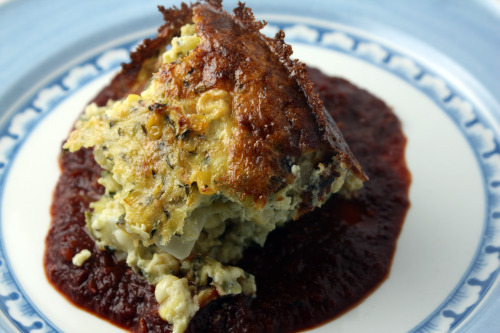 This timbale is like dome-shaped comfort and deliciousness! That looks wonderful. Rustic and elegant all at once. Yum. Dana, that looks more than appetizing — I want to grab a fork, and maybe lick the plate afterward. You know what? I think the timbale looks fantastic! It’s beautiful presentation. I love the ancho sauce you made. Man, this looks incredible. Wow! Now this is a dish you could curl up on the couch with. I love the idea of the ancho chile sauce (good advice on how to correct that too). Great recipe! this sounds sooooo yummy! and i think it looks gorgeous too! ancho chile sauce? you are killing me! did you put the 2 qt souffle dish in water too? I am thinking about making it soon for a dinner. Just wanted to say THANK YOU for this recipe, made it last night for our meat-free day and it was delicious – hubby had two helpings and happily there is some left over for my lunch today. I added some leeks to the mix as I didn’t have enough onion, and I cheated a bit and bought a tomato sauce but it was still yummy!